According to BBC Newsnight, the Walt Disney Company is negotiating with Carrie Fisher’s estate “over her continued appearance” in the Star Wars franchise. Before you jump to conclusions that Lucasfilm is definitely planning on digitally recreating the late actress for Episode IX, the Newsnight quotes were unspecific beyond the fact that negotiations are taking place. Carrie Fisher died less than a fortnight ago, but in the minds of Disney movie moguls and Star Wars fans, she’s very much alive. And with what might be regarded as unseemly haste, Disney is negotiating with the actor’s estate over her continued appearance in the franchise. 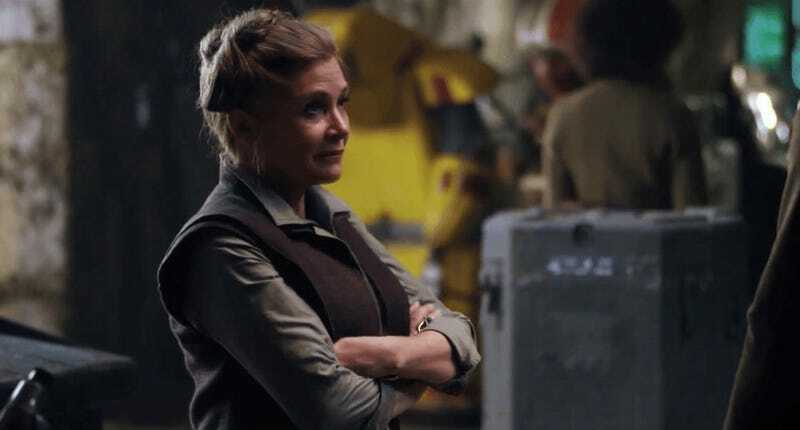 If Disney gets the go-ahead, Carrie Fisher will join Peter Cushing, who, last month, fifteen years after his death, played a key role in Rogue One as Grand Moff Tarkin. With computers, anything is possible, but is it desirable? While some living actors are contracting over the use of their image when they die, others, like Robin Williams, who killed himself in 2014, explicitly banned the commercial use of his image until 2039. So Lucasfilm could be negotiating Fisher’s appearance in Episode IX, just like Peter Cushing was put into Rogue One, but it could be something as simple as making sure they have the estate’s permission to continue to put Fisher’s likeness on merchandise. It could mean a variety of other things. And just because they’re negotiating doesn’t mean they’ll definitely use her likeness—Lucasfilm could simply be hedging their bets for the future. However, by comparing Fisher to Cushing, Newsnight does seem to suggest an on-screen, posthumous film appearance is in the cards. That wouldn’t necessarily be for Episode VIII, which Fisher had completed her filming for, but that’s also possible. Either way, it doesn’t flat out say anything definitive, so it’s impossible to say for sure. If anything, Newsnight is using the possibility of recreating Fisher as a jumping off point for a continuing ethical debate. It’s important to remember, too, that last week The Hollywood Reporter said that Lucasfilm executives and filmmakers would be meeting in the new year to discuss how Fisher’s passing would be handled in the upcoming films. Since that is some seriously secret stuff, we don’t know if those meetings have taken place yet or what was said in them. But it seems likely that no matter what decision is made, tying up legal loose ends so the company has the option to do whatever they deem necessary, would be an understandable turn of events. We’ve contacted Disney for clarification on Newsnight’s report and will update when we hear back.